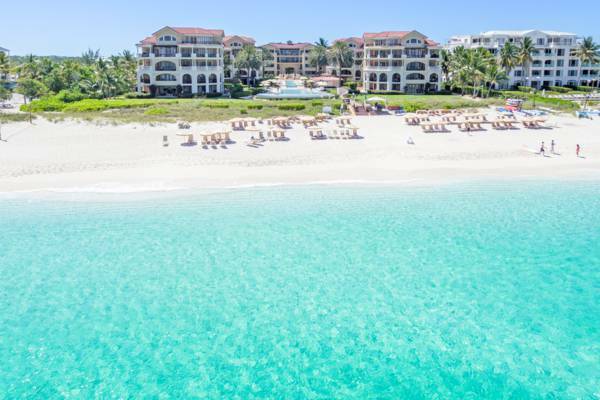 The luxury Somerset Resort on the spectacular Grace Bay Beach. The Somerset Resort in the Turks and Caicos. The Somerset is a beautiful and expansive luxury resort directly on the spectacular white sands and turquoise waters of Grace Bay Beach. This accommodation offers one, two, three and five bedroom full-featured suites and villas. The Somerset features 53 extravagant suites spread across several buildings. One aspect that sets the accommodations at the Somerset apart from many other resorts and hotels is the spacious setting, which follows the nature of a villa more than the typical hotel room. The Somerset villas have more than one bathroom, ample closets, and dining spaces. All rooms have either a balcony or terrace. Rooms are fully-equipped and exquisitely finished with marble floors and tiles, mahogany cabinets, luxurious bathrooms, full kitchens with granite countertops, and top-of-the-line Viking appliances. Included are complimentary fast WiFi, air conditioning, free parking, flat screen TVs and sound system, as well as a clothes washer, dryer, iron, and ironing board. Pre-arrival stocking of groceries can be arranged at extra cost by contacting the resort’s concierge. There’s a full range of amenities at the Somerset Resort. The grounds feature an expansive beachfront infinity edge pool, and 138 foot lap pool, a croquet lawn, and lush tropical landscaping. Complimentary water sports equipment includes Hobie Cat sailboats, ocean kayaks, stand up paddle boards, windsurfers, and snorkel gear. Lessons are offered for many of the water sports, so you’ll be able to get on the water with ease. There’s also bicycles for exploring the Grace Bay region. The fitness centre is complete with an array of training equipment and weights. There’s also lessons on Pilates, and yoga, both on land and by stand up paddle board! If you’re looking for a tranquil way to spend a few hours, the Teona Spa onsite at the Somerset is the perfect place to be. This full-featured spa and salon offers treatments both in the spa and in guest rooms, according to preference. The Somerset is a great Caribbean family resort, and is complete with a Kids Club, which provides a full program of outdoor and indoor activities, including local art and craft projects, beach games, sandcastle competitions, movies and more. The Somerset is home to two restaurants, the fine dining Pavilion, and the LunaSea poolside bar and grill, which offers a more casual fare of international favourites, and a comfortable setting to enjoy drinks. For a bit of nightlife, there’s a weekly beach BBQ. The Pavilion serves a menu of seafood and international fusion. Reservations are recommended for dinner. The Somerset is located on the eastern side of the Grace Bay region, and a bit farther from the shopping plazas than some of the other resorts. For conveniences and to save on transport costs, we generally recommend that visitors to the Turks and Caicos rent a car for the duration of their stay. With the exception of the Providenciales International Airport, parking is free and easily available throughout the country. Taxis can usually be found waiting at all major resorts, at the Graceway Gourmet grocery store, and at the larger shopping plazas. The beautiful beach snorkelling site of the Bight Reef is located one mile (1.6km) from the Somerset Resort. Simply head west (left if you’re looking at the ocean) and look for the network of marker buoys that protect the reef. The Windsong Resort, Coral Gardens Resort, and Somewhere restaurant are adjacent to the reef, and are difficult to miss.